Jordu Schell is a Designer, Sculptor, Anatomy Expert and VFX Legend. Jordu is one of the most sought after and brilliant conceptual sculptors of our time. His work is highly acclaimed in the visual effects & entertainment industry, and his passion for teaching and sharing his experience with students and peers is unparalleled. He is the founder of Schell Sculpture Studio in Los Angeles, CA. A full service sculpture and design facility with a wealth of talent to match the need of any project. His studio specializes in creature and character design, props, prototypes for toys and model kits, general special effects work, and creature design classes. His talent as a designer and sculptor is world renowned, with his credits including: “Avatar”, “The Chronicles of Narnia: Prince Caspian”, “300”, “Hellboy”, “Aliens vs. 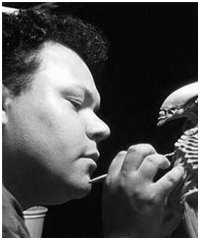 Predator – Requiem”, “Men in Black”, “The Mist”, “Batman Returns”, “Edward Scissorhands”, “Alien: Resurrection”, “The X-Files Movie”, “Predator II”, “Galaxy Quest”, “Evolution”, “Babylon 5-The Series” (on which he designed an Emmy Award-winning creature make-up and the first fully digital creature for a television series), and many more. To know and learn from Jordu is to find the Master’s path of creature design, and he’s extremely entertaining. Yes, learning can be fun. Quote: "There was a student once who expressed he was hoping for more "tricks and tips" and I had to explain to him that this work is not based on a trick and it’s not based on a tip... its working, and practice and practice and practice and working and practice"